This is the story of two bus stations, one of which embodied a town’s past, and one of which is intended to define its future. The town is Slough, some 20 miles west of London. I feel a bit sorry for the people of Slough. The town has acquired an unfortunate and unjustified reputation for being aesthetically and culturally unappealing, and having lived in a couple of towns with similar reputations, I know what that’s like. To be honest Slough is no worse (if no better) than many, many towns across Britain. It might not be historically significant, it might not be the location of any nationally significant visitor attraction, but let’s face it, we’re not talking urban wasteland here. If American readers are struggling to get an idea of the problem, then it might help to think of Slough as occupying the same sociogeographic space as one of America’s flyover states. It’s just that, essentially, there’s little need to go there unless you already are there. But somehow Slough has found itself in the cultural crosshairs in a way that many similar towns have not. Poet john Betjeman called for “friendly bombs” to fall on the town in his 1937 poem “Slough”, adding that “it isn’t fit for humans now”. BBC television sitcom The Office was set there because it was seen as the perfect boring, bland and unattractive town to act as backdrop to Ricky Gervais’ monstrous creation David Brent, the manager of paper supplier Wernham-Hogg. And that’s where Slough’s first bus station fits in. Prominent in the opening credits of The Office (see them here) is the Brunel Bus Station, which opened in 1975. I suspect the evocation of the great name of engineers/designers/architects/polymaths the Brunels might have rankled amongst those who dislike the bus station. True to its date of construction, Slough’s Brunel Bus Station was designed in the Brutalist school of architecture. So it was big, blocky and uncompromising, and in the manner of many Brutalist bus stations was actually a multi-storey car park with the ground level given over to buses. But it had some degree of charm, too. 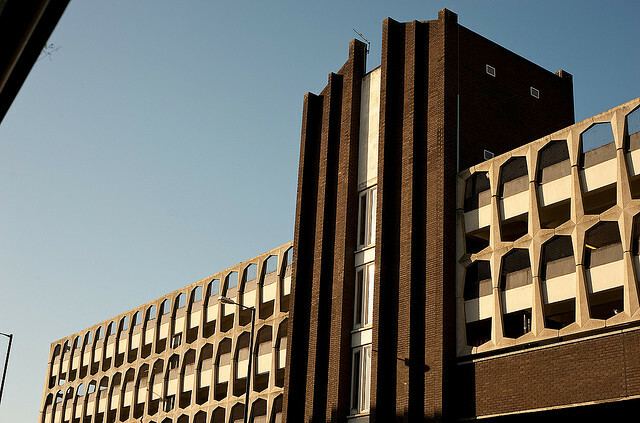 Unusually for a Brutalist building, it had considerable decorative attention to detail. The Twentieth Century Society called it “somber but expressive”. The car park levels sported external concrete detailing which created a repeating pattern of four-pointed stars along the upper stories. 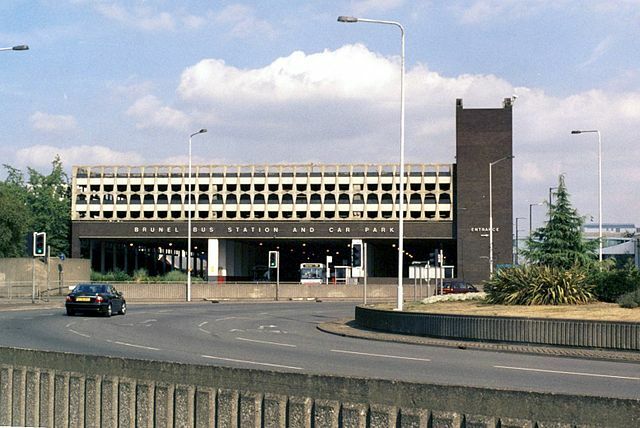 Nevertheless it was a bit of a hulk, as Brutalist buildings are wont to be, and it came to symbolise Slough in the wrong way. It was not, I think, the kind of building that the good burghers of Slough wanted as a visual summation of their town. Its inclusion in The Office’s opening titles as a symbol of everything that was wrong with the town was the final nail in its coffin. It pushed local agitation for its replacement to the point where that agitation was acted upon. In 2009, Slough Borough Council finalised plans to completely regenerate its town centre in a £450m project called the Heart of Slough. It was a bit like one of those ageing Hollywood stars who, rather than aging gracefully and accepting themselves for what they are, opt instead for a radical facelift. They look newer and shinier at the end of it, but they’re somehow no longer connected to their own history, and there’s always an awkward join with the non-facelifted remainder. But that was Slough Borough Council’s choice to make, and make it they did. The Brunel bus station came down in 2010. So, number one job in the regeneration of Slough town centre was a new bus station. As so often, a piece of public transport infrastructure became the cornerstone of a wider regeneration programme. Step forward bblur architecture. Whatever you might about the idea of building your way of a town’s reputational issues, bblur came up with something rather good, and with a great deal more character than a lot of recent bus stations. While curving glass walls, steel frames, and an irregular floorplan are all very nice, that’s been the pattern of many recent new bus stations, and after a while they do get a bit same-y. blur, on the other hand, produced a sort of sea creature, covered in silver aluminium shingles. 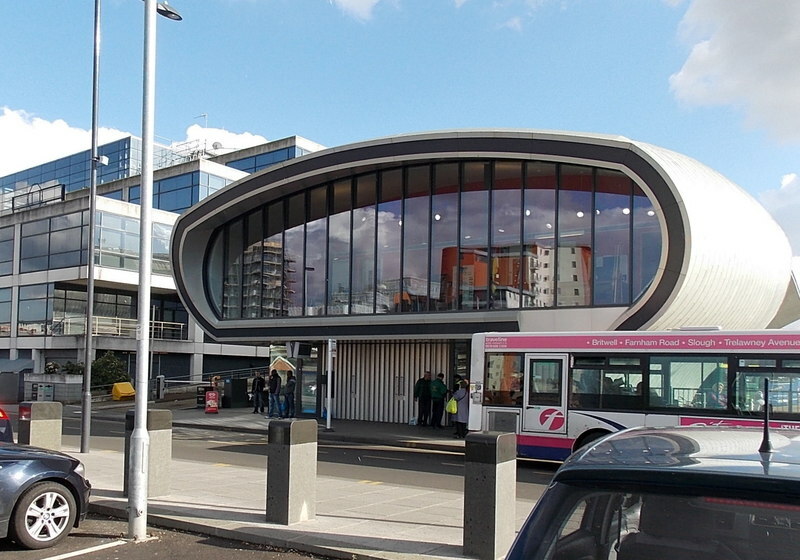 Situated on a long thin site facing Slough’s railway station, the bus station is an organic, deconstructivist building of curving walls and undulating roof lines. It opened for business in 2011. The north end of the bus station is a building which contains a shop, a café and a waiting room, as well as administrative space. The end walls, facing onto the street which separates the bus station from the railway station, and onto the bus station’s external waiting area, are largely glazed, an inviting detail that contrasts with the admitted stand-offishness of its predecessor. From the south, a 70m extension of the roof is formed of two tubular elements, linked by a long skylight. This canopy covers the external waiting area and a new pedestrian route alongside the bus station. It is supported by criss-crossing metal columns, and the plan is to extend it by another 60m as the Heart of Slough scheme progresses. A zig-zag glass draught screen separates the external waiting area from the buses themselves with automatic doors allowing passengers to get on their buses when the time comes. Needless to say, this being England and the English enjoying nothing more than not enjoying modern architecture, its arrival hasn’t been without controversy. True to the fashion for giving a rude nickname to any piece of interesting architecture (see also Weston-super-Mare’s ‘carrot’ for a transport example of this trend), several local critics have described it as a “slug” (see here, for instance). Speaking in its defence, Slough Borough Council’s commissioner for neighbourhoods and renewal James Swindlehurst described it as a “silver dolphin” with a shark-like mouth (see the story here), betraying a concerning lack of famililarity with marine biology, not to mention hardly instilling residents with a warm fuzzy feeling about their new bus station. Meanwhile, in the same story, one local suggests that it looks like a beached whale, while another’s chief criticism is that it looks “too new” compared to the town’s 1884 railway station. 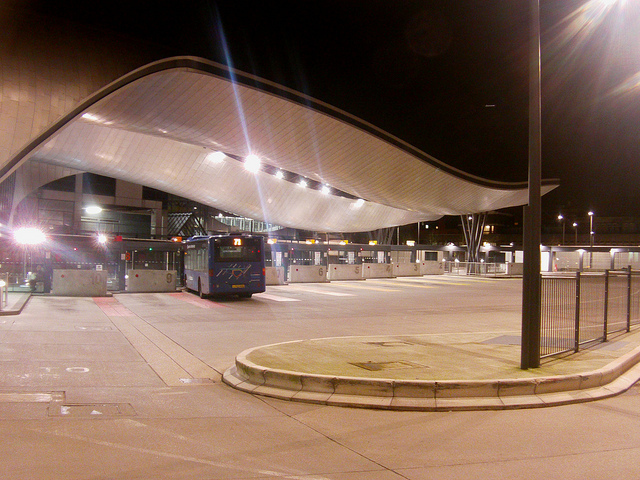 Yes, the new bus station looks too…new. One early (and perhaps more reasoned) criticism was that the bus station lacked toilets. This has since been rectified although the toilet has had some maintenance problems. 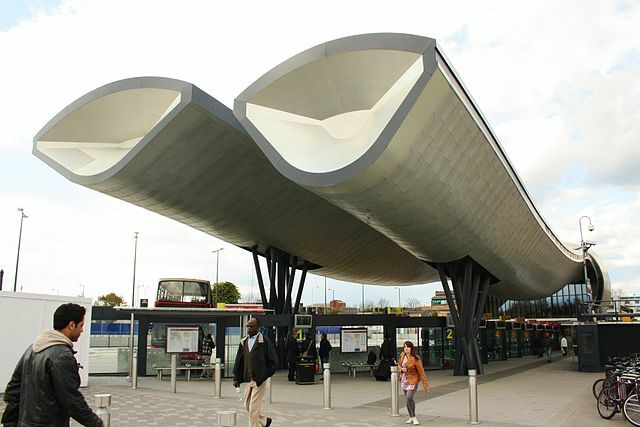 A more concerning criticism was the bus station’s canopy failure to provide adequate shelter. Rain was able to blow in under the canopy causing passengers to get wet while waiting for the bus (if they were waiting outside rather than in the café). Councillor Swindlehurst pointed out that the bus station was more exposed to high winds than it was designed to be, because surrounding buildings forming other elements of the Heart of Slough scheme had not yet been built. The solution was to install some smaller glass shelters under the larger canopy. To be honest, the only way to stop rain blowing in to an open sided building is not to have open sides at all. Then you’d have something like the gorgeous Nils Ericson bus terminal in Gothenburg, Sweden (much admired, rarely bettered). But that comes at significantly greater cost, and given that critics of Slough’s new bus station have already deplored the £11m spent on it, I’m not sure what else the council was supposed to do. bblur has certainly given Slough an eye-catching centrepiece for its town centre revitalisation. If we’ve lost a bus station that had its fans, at least the town opted for a new bus station of some degree of merit, rather than scattering bus stops to the four winds, leaving them dispersed around the town centre, as has been the case at many other British towns in recent years. Has it worked in revitalising Slough’s image? Well, judging that will probably take until all the other parts of the town centre have also been transformed. But with the upcoming electrification of the main line railway through Slough and its inclusion on the new Crossrail line, helping to position it as a more accessible location, it might well do. And The Office isn’t on the television any more, either. I really like it, it is most unusual. Although, Like you mention, it really should be more enclosed. Like the generic glass bus shelters that appear in every post pedestrianised small town. Attractive but missing sufficient protection from the elements. However, despite that point it is a massive improvement over the brunel bus station that I used to pass through on the way to/from heathrow. On a bus statiob related note: my own town (paisley) also has a concrete bus corridoor under a car park which they have attempted to spruce up with lights. People don’t like it because it is new. They didn’t like the old one because it was old. You can’t win. I suspect that’s exactly the case. I wonder if it’s a British thing or whether it’s the same in other European countries or America? Actually, I suspect it’s more to do with lazy media. Unhappy people make easy stories and since you can ALWAYS find someone who disagrees with something, everything is disaproved of. It’s certainly divisive. I like it, but I take your point about the lack of shelter. Trouble is, as a bus station, the old version probably worked better but it was old and so rather than restoring it, it had to go. Same treatement dished out to the Northampton bus station, also replaced by something that sticks passengers out in the rain.